On Stephen Colbert’s last Colbert Report episode this past December, he joked about how little had changed during the nine years he’d been on air. “Another Bush governor is running for the White House. People on TV are defending torture. We are sending troops into Iraq. And just take the NBA championships, both in 2005 and 2014 — I had to look up who won.” OK, so sure, the world didn’t make great strides in any of the aforementioned things, but that doesn’t mean Colbert — or The Colbert Report — stayed stagnant. Even though this beloved funny man has always been brilliant, the political satirist of our generation has made huge strides since the first episode of The Colbert Report marked his parodical debut as the pundit we’d all grow to admire. September 8 marks the night of Colbert's debut as The Late Show's host, and I can't help but feel so many feelings for this milestone he has achieved. 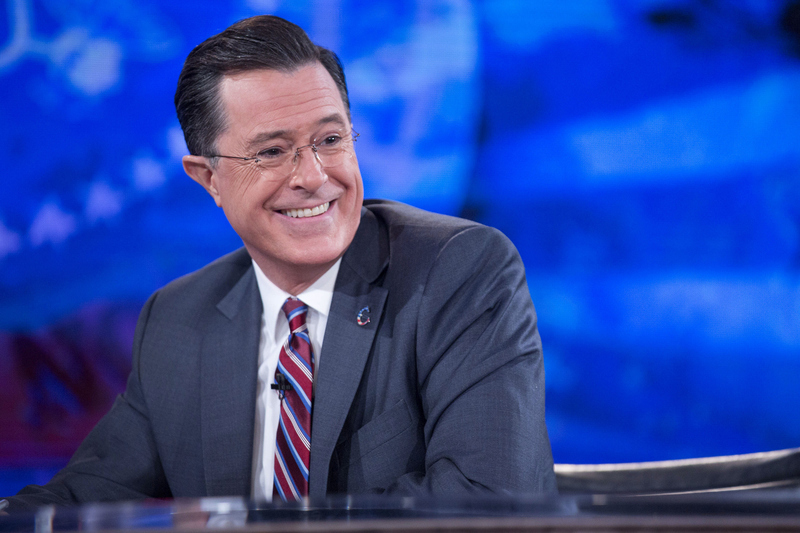 Chief among those emotions is nostalgia for his first episode of The Colbert Report (RIP). Even though he's probably old enough to be my father, I'm proud of him. (I'm also super attracted to him. Is that weird? Inquire within.) After his recurring role as a deadpan correspondent on Jon Stewart's Daily Show from 1997-2005, Colbert decided to take his own show on the road, so to speak. At first, the critics weren't exactly picking up what Colbert was throwing down, but, like any political genius, Colbert was way ahead of his time. The world just needed a bit to catch up. Let's take a look back at his first episode of The Colbert Report just to see how far he's come, and also be thankful for the things that haven't changed. Let me just be superficial for a moment here: Stephen? Babe? (Can I call you babe?) What's your skin care regime? OK, back to reality. Perhaps this is more of a testament to just how true to character Colbert was able to stay through his nine year reign. It even looks like he might have never changed out of those glasses. When he first came onto the scene, people didn't know what to make of Colbert. Was he serious? Was he joking? Should we laugh? After a few episodes though, loyal fans started lining up by the dozens. Now I challenge you to meet any American who doesn't know of Stephen Colbert. Better yet, I challenge you to meet an American who doesn't like him. You better believe that the screams and claps for The Late Show might make Colbert's intros nearly inaudible. Can't fault the audience though. He's, like, kind of a big deal now. You can practically hear the angels descend as Colbert proclaims, "Welcome to the very first Colbert Report!" He then goes on to explain the premise of the show, in the most self-aware, Colbert-esque way possibly, saying, "Got a lot to do tonight. A whole big world to fix. I know that this is my show... but this show is not about me. No, this program is dedicated to you. The heroes. And who are the heroes? The people who watch this show." Although he won't be in this character come the Late Show premiere, let's hope Colbert brings this kind of self-awareness. Colbert's first guest was none other than the former co-anchor of Dateline NBC. Although he's a well-known news anchor and a solid first guest, let's just say that nothing screams "you've made an impact on our society" quite like having THE PRESIDENT OF THE UNITED STATES (sorry for the caps, but not really) on your show. Colbert set the stage for how this (i.e. his show and/or legacy) was all about to go down on his first segment of "The Word," when he so astutely stated, "The truthiness is anyone can read the news to you. I promise to feel the news at you." This riff on the concept of “no thinking” when it comes to media and news consumption feels too relevant nine years later to conclude anything other than the fact that Colbert is actually a genius. The word "truthiness" was incorporated into most of the "Introductory Phases" of the show thereafter, and proved to be an inherent theme of the show, and in everything he does. In his final “The Word” segment (BRB still crying), Colbert added that he did indeed “deliver” a revolution, noting, “because technically, one revolution is 360 degrees right back to where we were.” If back to where we were involves seeing Colbert on my TV screen again, furrowing his brows at me with a solid dose of intellect and dry humor, then hey, I’m totally cool with the legacy of "sameness" he left behind.